If your water source is uncertain, you should treat it first before drinking it. One best way to purify water for drinking is to boil it for 1 minute. Once the water has reached a rolling boil, it has become safe to drink. Note that if the water source had been contaminated with chemicals, boiling it or otherwise treating it will NOT assure that the chemical is removed. Know your water source as best you can. 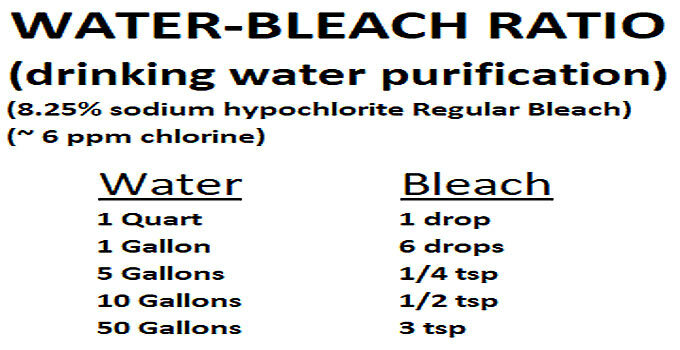 Another way to purify water is to use a small amount of Regular liquid bleach. Use Regular household bleach, with the only ‘active’ ingredient ‘sodium hypochlorite’. UPDATE: For many years Regular bleach contained a concentration of 5.25% – 6% sodium hypochlorite. Newer ‘Regular’ liquid bleach now contains a concentration of 8.25% sodium hypochlorite (about 30% more than the original bleach formula). Having recently determined how much bleach to add to a 50-gallon water tank to purify it for safe drinking, I’ve put together the following charts for your reference. Mix the following amount of bleach with water, and wait 30 minutes for it to work. The water should have just a ‘hint’ of chlorine smell. The initial chlorine level (ppm) will drop when interacting with water and organic contaminants (it’s doing it’s job). This may occur slowly or precipitously. If the water is cloudy, and if you still cannot smell any chlorine in the water after having let it sit for 30 minutes (there should be a hint of chlorine smell), the CDC (Centers for Disease Control) advises that you consider a 2nd round of treatment. According to the EPA, the maximum recommended ppm (parts per million) of chlorine bleach in drinking water is apparently 4 ppm. Generally speaking, water that has a chlorine level of 4 ppm would smell very strong of chlorine, whereas a ‘hint’ of smell indicates a level well below that. A chlorine test kit is the only true way to know for sure. Bleach will lose its potency (fairly quickly) over time. Generally, 6 months to a year after its expiration date may result in half strength. Good Information Ken but folks need to remember that the above information is for clean water. Organic material adsorbs a lot of chlorine, so prefilter your water with at least a tee shirt before adding bleach. If the water is very dirty, yes, pre-filtering through cotton or other means will enable more efficient chlorine purification of organics that remain. Also, avoid scooping water near the bottom of a source – which may kick up some sediment. Scoop from the top. Also, as I said above, the smell test is recommended. If there’s a hint of chlorine, you’re likely good to go. If not, add more. Note: It is recommended that you wait 30 minutes for better assurance of effectiveness prior to drinking, especially if the water is cold. For water purification for drinking, chlorination with bleach is not completely effective against Cryptospridium though it is against Giardia. Both of these protozoans can sometimes be found in both springs and vertical wells in the US. 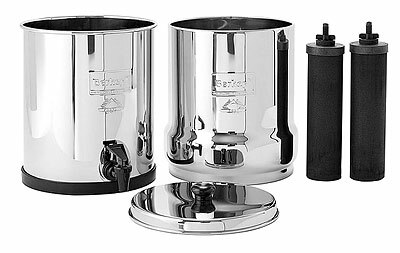 The only effective water purification methods for Crypto are boiling and microfilters. Microfilters do not generally remove 100% of viruses but this is not necessarily a problem in the US. All waterborne enteric viruses affecting humans occur solely in humans, thus animal waste doesn’t present much of a viral threat. Keep your source free of human waste and a microfilter should suffice. Easier to do now but could be more of a challenge in SHTF. Keep your bleach handy for viral contaminants and your microfilter for most everything else. And now days “they” say you’ll die from drinking from a Garden Hose…. Good reminder Ken on the quantity of Bleach to Water ratios. Another idea is to store Pool Shock, much different ratios though, make sure to store it properly, Chlorine fumes in concentration are bad mojo for sure. NRP Pool Shock and some Evil Ingenuity can make an over run home temporally uninhabitable to run those Gimme Dats out for your attention. Look at it’s MSDS for details of this. I call it the Sampson Jr. Option when you’d like to return to your home with minimum damage. Hope you never need to do it but it is an pre-arranged option for bad times. Come on, Bro…. everywhere I read, says 3 TABLESPOONS per 55 gallons. If you’re going to publish stuff like this, get it right! So no problem with the 1/2 per 10 gallons??? Yet 3 teaspoon full is 6 times the water, so 60 gallons????? Hummmm, interesting for sure, maybe you need to “get it right”? Hey Bro, 3 TABLESPOONS will certainly purify that barrel. In fact, disinfect it. However the chlorine ppm will be so high, I would hesitate to drink it at that potency. 3 TEASPOONS however will result in ‘about’ 6 ppm, depending on the water condition itself. Read the article. Thanks guys. Was just thinking I need to print this off. Ken – what’s the ratio for making bleach from pool shock to get the right percentage/strength to use this chart? Be nice to have it all in one posting. Thanks! Thanks for pointing that out. Absolutely correct.